Cricket - Walsden v Heyside. Walsden bowler Joe Gale. Joe Gale made it a 312-run weekend and set a new club record as Walsden completed a quick hat-trick yesterday. 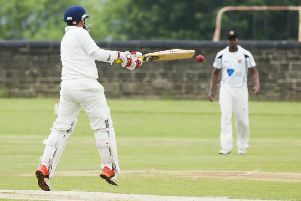 Gale fired the Scott Street club into the next round of the Lancashire Cricket Board Cup with an unbeaten 148 as his side eventually made light of what promised to be a tough test at home to Formby. Walsden were struggling at 74-5 when Gale came to the crease but his innings, which spanned only 91 balls and included 18 fours and seven sixes, lifted his side’s total to 298-9. He added 131 with Stevie Barker (37) for the sixth wicket. Shellshocked Formby were then bowled out for 112, after being 82-3, with Sri Lankan Umesh Karunaratne taking 5-5. Gale’s score eclipsed the previous best by a Walsden amateur, James Rawlinson’s 146 not out made last year. Gale’s weekend to remember had started with a knock of 102 not out in a T20 win at Milnrow on Friday and continued with an unbeaten 62 in a league success against Rochdale on Saturday. Also in the LCB Cup yesterday, Todmorden lost by one wicket away to Farnworth. A 171-run stand for the third wicket between professional Chris Schofield (86) and Bilal Abbas (88) helped them to 226 for six off 45 overs after Andrew Sutcliffe had elected to bat. Farnworth were 80-1 and 148-3 but Tod kept plugging away and set up a tense finish by claiming by eighth and ninth home wickets with the total on 225. However, a boundary off the first ball of the 42nd over, bowled by Abbas (2-20), gave the Bolton club victory. BRIGHOUSE moved through to the second round of the Bradford League’s Jack Hampshire Cup yesterday but Northowram Fields crashed out. The Russell Way outfit were comfortable six wicket winners at Spen Victoria, producing a tight bowling display and then knocking off the runs inside 28 overs. Spen’s openers put on 55 and Oliver Davidson added 46 but the home side had to settle for a 40-over total of 172-8. Amrik Singh’s 86 not out off only 72 balls helped the visitors stride to success. Northowram Fields fell victim to Birtsall’s prolific batsman Eric Austin, who hit 106 not out. He shared an opening stand of 152 with Josh Haynes (92) to put the visiting Rams on the back foot on the way to a total of 275-2. The visitors struggled from the start of their reply with Lord Kamlesh Patel, making a rare first team appearance, hitting 23, Kyle Welsh 24 and Will Parkin 23 not out in a disappointing total of 108.